Today we are looking at a sewing machine from the sixties. This Universal Sewing Machine Model KTBR doesn't have a lot of functions but it makes a great stitch. 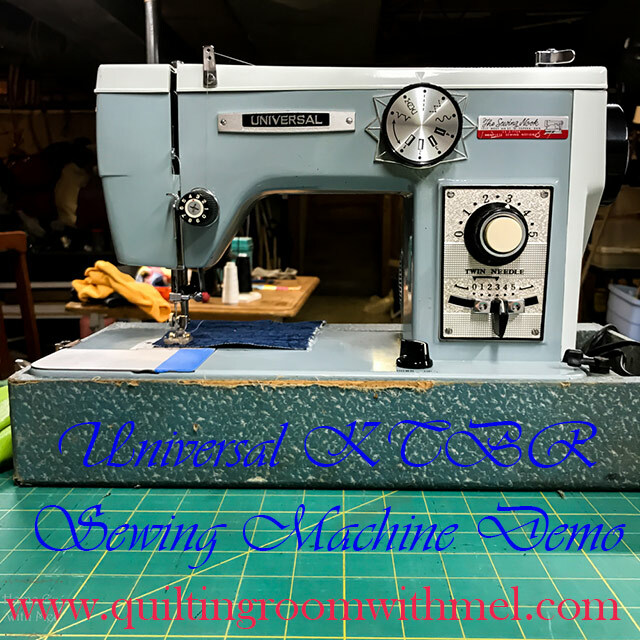 Even though it doesn't have a lot of bells and whistles it does have what it takes to piece quilts, home decor sewing, and basic clothing sewing. Those kinds of sewing projects don't take 300 different stitches, a good straight and zigzag stitch is about all you need. 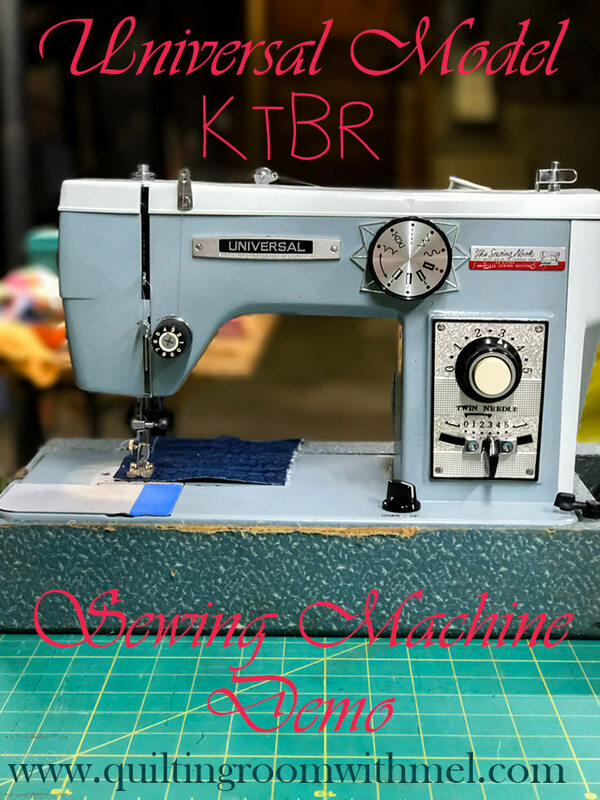 The Universal Sewing Machine Model KTBR is NOT an industrial sewing machine. Yes, it is sturdier than most machines on the market today and it will deal with some heavier fabrics than today's machines. It is still a household machine. It was designed for what someone in the 60s would typically sew at home. If you'd like to know a little more about domestic sewing machines and industrial machines be sure to check out our Motors Myth and Mysteries post that explains some of the differences between the two. So let's check out the machine in action. We will wind a bobbin, thread the machine, and look at the two most popular stitches, straight and zigzag. I also show the stitch that I originally thought was the zigzag on the dial. Well, that's the Universal Sewing Machine Model KTBR in action. It's not a really fast sewing machine but that's OK. Not everyone wants a fast sewing machine. The simplicity of it makes it perfect for new sewist who might be overwhelmed by some of the machines that make lots of different stitches. A little side story about the machine for you. We picked this machine up at a garage sale that I found on Facebook. It started on a Thursday morning and there were tons of machines in the pictures. I didn't think anyone would be running over first thing on Thursday or be interested in all those vintage sewing machines. We headed over when Paul got home from work and there were only a few machines left. The one I wanted was gone. Someone had bought all of the other machines. Paul asked me about the shop badge on this machine. I looked at him funny because I had never heard of the place and he has worked as an HVAC tech in that town forever. I told him since mom used Necchi and Juki we went into KC for sewing machine needs. When I Goggled the place I realized why neither of us had ever heard of the place, it closed the year I started Kindergarten. That was way before he was working in that town and I don't remember much from that time in my life. I still giggle at the fact he thought I knew every sewing machine shop in 100 miles of us. To learn more about sewing machines and how to use them be sure to sign up for our newsletter. Each issue has some behind the scenes peeks, some sewing ideas, and some information about the older sewing machines. There's something for everyone! Don't forget to pin the image below so you can find this post whenever you need it. I recently inherited my grandmother sewing machine which is a Universal Model KTBR serial number 405280 that is housed in a stand. I have no idea how to get parts for it because it needs a new foot/knee pedal because the wiring has dry rotted. It still works but I have no information on it is there any way you could help guide me in the right direction.